A draft of ICH Q11 covering Development and Manufacture of Drug Substances is now available here. Scale-up Systems is recruiting customer facing Technical Applications Consultants to support our growing business in North America, Europe and India. In this key position, you can help change how the pharmaceutical industry works, putting DynoChem predictive tools that are fit for purpose in the hands of chemists and engineers. Applications to join our team are welcome. More details here. Simon Brooke interviews Joe Hannon at DynoChem 2011 User Meeting, London. As the final part of a general update of our crystallization tools over the last year, we have just updated the utilities and models for size distribution calculations in DynoChem Resources. The CSD/CLD tools are primarily for academic research purposes, rather than industrial application. This is for two main reasons: i) most industrial problems can be solved without modeling the number balance/size distribution and ii) quantitative interpretation of measured size data for modeling remains a challenge (see e.g. reference 1). Our models include options to 'calibrate' e.g. CLD data to close the mass balance. You can find out more by reading the related Knowledge Base article. For an example of mainstream application of DynoChem to industrial crystallization problems, see our Crystallization training exercise instead (Operation 5 in the manufacturing stage). “We did promise you a blast of U2 and I think you’ll agree that it has, indeed, been a Beautiful Day.” And the audience certainly agreed with Joe Hannon as the discussions continued and new ways in which to use DynoChem as it develops its capabilities were suggested. Joe then outlined some of the exciting new developments that DynoChem users can expect in the future. “Thanks to Steve Hearn and our Development Team, we’ve made DynoChem easier to roll out and made it quicker and simpler for your IT colleagues to manage". Forthcoming initiatives include a new interface in the DynoChem Resources website using Microsoft Silverlight to provide easier search and navigation. In the meanwhile Joe urged users to visit DynoChem Resources to find out more about other ways in the software can help speed experimentation and reduce costs. Not surprisingly given the quality of the day's presentations, finding a winner of the prize for best presentation was tough and when customer votes were counted, at first it seemed that there had been a three-way tie for first place. 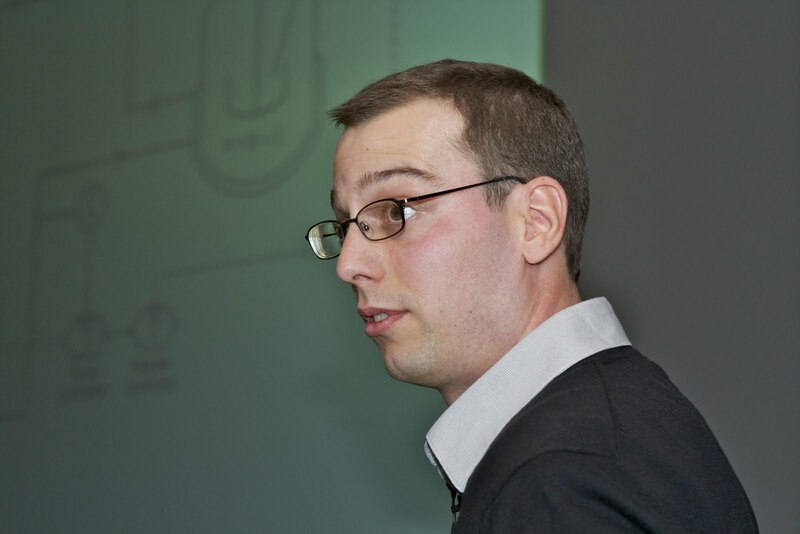 However a quick recount revealed that Marcello Bosco of Roche Basel (pictured above) was the outright winner with his discussion of "Thermal Scale-up – Vessel Characterization and Reaction Modelling with DynoChem". Amid envious glances from colleagues, Marcello walked away with an iPad 2. Great for tapping out ideas when inspiration strikes outside the lab! Joe ended with a call to action. “We’re proud to be sponsors of an AIChE award for excellence in quality by design, along with Pfizer and Merck and I’d like to ask you to get in contact if you know of any additional candidates for the 2011 prize, people who are doing great work that should be recognised." When it comes to achieving these excellent results, DynoChem will be there, playing its part.